Keeping with the Sushi theme, I went to Nori for lunch on Monday following my Sunday night dinner at Macku.It wasn't exactly planned, but I was meeting Joanna for lunch and she saw that they serve half priced maki from 11am-6pm. Yes, half price rolls for 7 hours. We decided to give it a go since it's new, carved out from space from Penny's Noodles next door. For the $23 we spent on an order of gomae and 4 maki rolls, the food was good. Is it the best sushi on the block, not likely. But it was fresh and good and perfect for lunch or an early dinner. My room mate says good sushi isn't cheap, and I agree. However I am also looking for cheap sushi that is good, and this qualified. 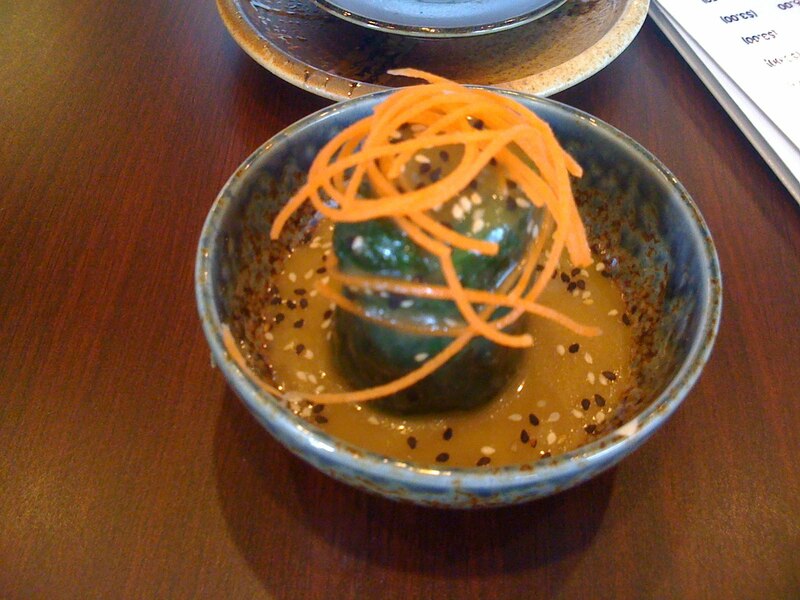 Unlike the gomae from Macku, this was served traditional with only sesame dressing. 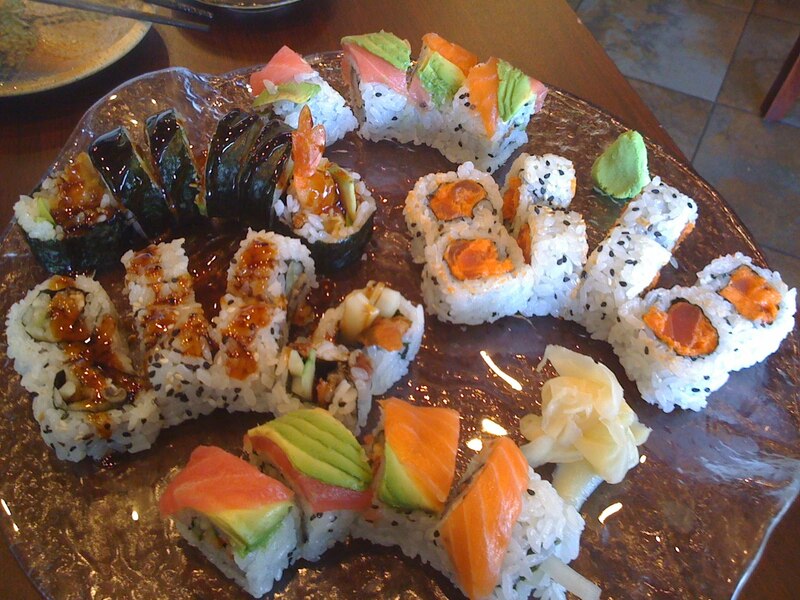 We ordered four rolls for the two of us because we were hungry: Ebi Tempura, Spicy Tuna, Unagi-Q and Rainbow. The spicy tuna was more mayo and less tuna, but tasty none the less. The rainbow was standard, nice to have fresh avocado at the start of spring. My favorite though was the Ebi tempura, a great combination of crunchy tuna with avocado and unagi sauce. Again, not ground breaking but I could eat a lot of sushi when they only cost $3-4 each. When you combine good food with friendly service and a convenient location you get a recipe for success. Next time I'll go back for 6pm BYOB sushi dinner with a group of friends. Maybe you should too. I'll admit, I never went to Kaze sushi in Roscoe Village though I had heard of it before closing. Lucky for me the family business didn't end, it just moved. This time the brother of Kaze has the name on the door, Macku Sushi. I knew this wasn't your ordinary local sushi joint, but I was presently surprised with the menu offerings and execution of this upscale Japanese establishment. Ironically enough of all the different plates Erica, Alyssa and I tried, the sushi was the least impressive. 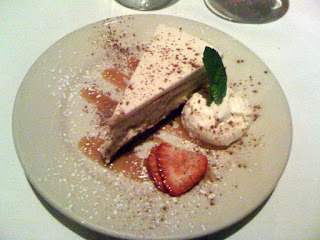 Everything else from the soup to the dessert was very tasty and noteworthy for the presentation and overall quality. I might go back for some special sushi, but more likely return to try the entrees I missed this time around. Whatever you choose though Macku is no secret, and the limited tables could make getting a reservation tricky. I wasn't the only person who wanted to see what the other half of that family could produce. As for what we ate, we started with my favorite Japanese starter, gomae. This wasn't any ordinary gomae, as it was served with a fried banana and sweet potato crisps. While I prefer my gomae simple and served chilled with sesame peanut sauce, I do take some blame for not reading the menu closer and reading the fine print. It's not what I expected, but I appreciate the varying textures and combination of flavors from the spinach, sweet bananas and crispy sweet potatoes. The presentation, like everything else served, caught my attention. It is only appropriate that one month before I take off for Nepal that Erica and I meet old friends (the Hirsch's) for dinner at Mt. Everest restaurant in Evanston. 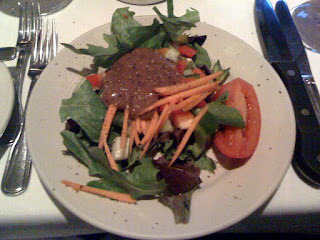 I generally enjoy Indian food, though I have not had it in a while and from what I've heard Mt. Everest is as good as any in Chicago. The four of us had a fine meal, lots of good food to share. If this is what I get to look forward to everyday in Nepal, I might come home much heavier than I left. We started with some garlic naan (old school garlic bread) and Keema Samosa (minced lamb inside pastry). Everything after we ordered was family style accompanied with rice and more naan. We each choose a dish: Erica went with Tandori Chicken, I picked Chicken Saag, Stephie ordered Aloo Gobi (cauliflower sauteed) and Joel delighted us with Keema Mutter (minced lamb part II). The serving dishes do not look very big but they provide plenty of food. We only finished one dish, the cauliflower, and took home everything else. My favorite was the minced lamb, which is surprising because I'm not much of a lamb person usually. The chicken saag was tasty, especially the sauce, but the meat was a tad fatty for my taste. I could eat good meat on rice almost every day; throw in some vegetables and that's a balanced diet. Definitely check out Mt. Everest for good and cheap (the entire bill was $80) Indian/Nepali food. I realize ethnic food served in the States in not usually similar to where it came from, but if the style and flavors at Mt. Everest are anything like what I will eat in a month, I will be very full and happy. Where do 4 guys for for a cheap, quick lunch on a Saturday afternoon? 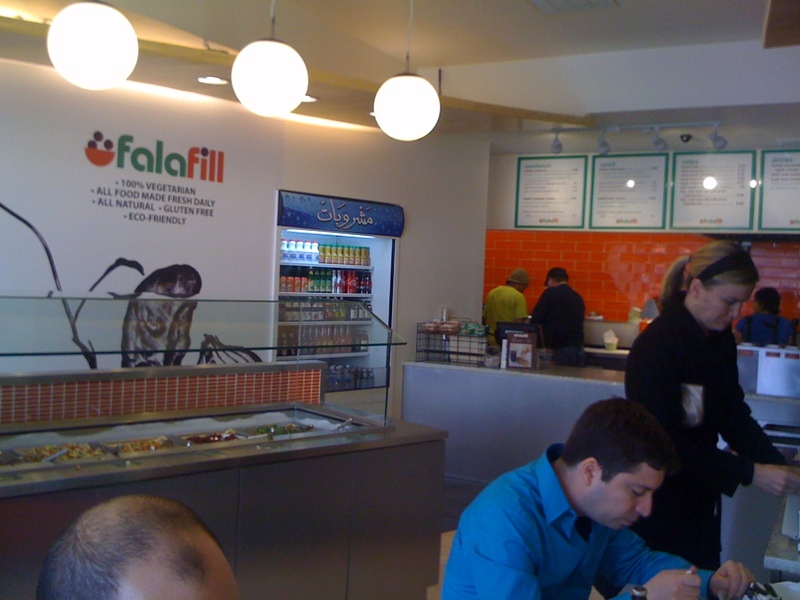 The answer was Falafill. I had never been, but heard good reports. Even though it was only in the 40s today, the sun was out so we took a walk. My hunger level wasn't there for a full meal, but I did manage to get a taste. The sides I had were all great, and my friends thoroughly enjoyed their sandwiches. 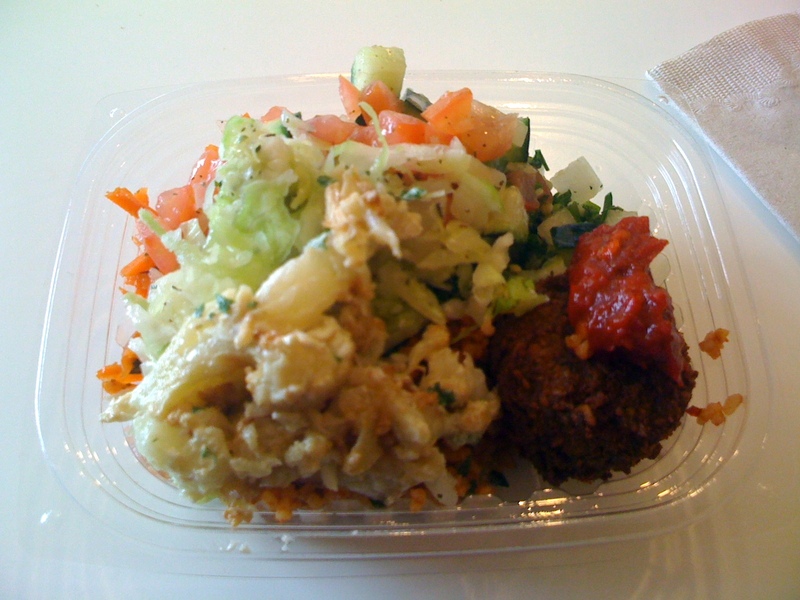 I've wondered why there are not more high quality Mediterranean/falafel stands. If there are please let me know. Besides serving good falafel, there is a do-it-yourself fixings bar for customization. All food is 100% vegetarian and well priced. Stopped into State St. Pizza Co for lunch with two of my buddies. 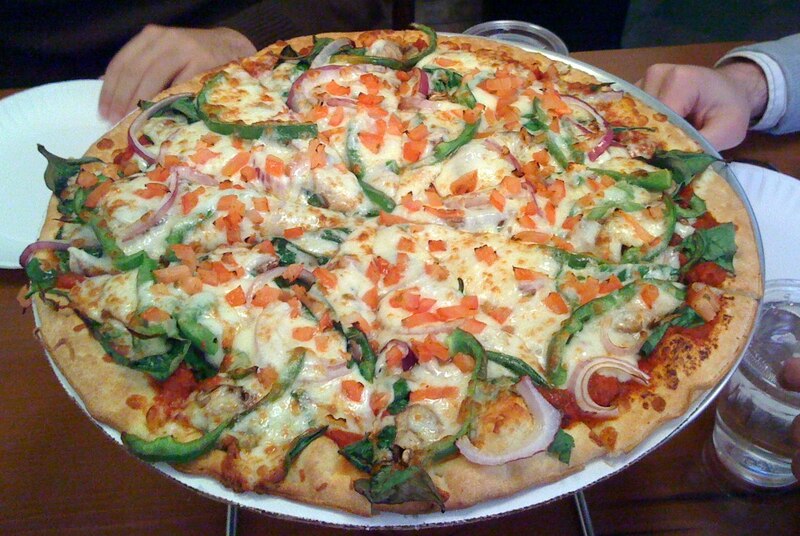 We ordered a large garden, which is a loaded vegetarian pie. Value is pretty good; 14in specialty for $19 all in. 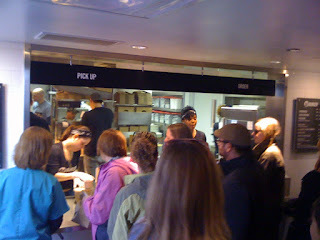 I was surprised how fast the whole pizza was ready; the place wasn't busy but speed is important during lunch hour. The crust could have been a little stronger, especially in the middle, but the veggies were fresh and there was plenty of cheese to go around. I wouldn't say it's the best pizza I've had, especially in Chicago, but River North needed a quick, by the slice joint. Since they are open late, it might be worth a stop after a night out. .I dined at Mercadito for New Years Eve and was so impressed with their prix fixe offering that I had to go back for a Chef Week menu for only $20 at lunch time. The format was the same as NYE, you choose a guacamole course, a ceviche course, a taco course and dessert. Since all but the taco course are made "for the table," going with a table for 2 is the best value. As I expected the food was great with plenty to go around. My only complaint with this visit is that our service was substandard. Our third taco course was forgotten, it took time to get service and to top it off, the computer crashed and we waited 20 minutes to get our check. I still recommend checking out Mercadito because the food is top notch, we just ran into an unlucky service breakdown (or so I hope). The National Restaurant Association is calling all culinary professionals and enthusiasts ranging from professional chefs to amateur home cooks, culinary school grads and foodies. 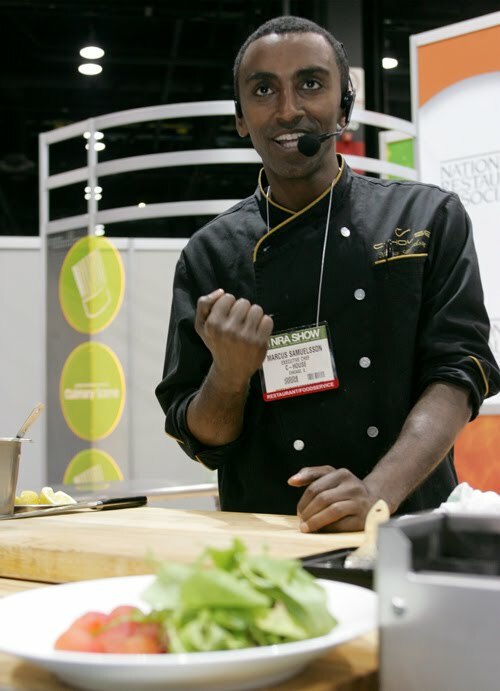 Show off your cooking skills and enter the 3rd annual NRA Hot Chef Challenge 2010 for the opportunity to experience culinary stardom during this year's NRA Show, May 22-25 at Chicago's McCormick Place. How to enter: Film an original two minute (or less) video demonstrating your recipe and submit your video to our YouTube page by Thursday, April 29. Recipes must include at least one fresh produce item, plus any other ingredients of your choice. For inspiration, competitors should refer to the National Restaurant Association's "Chef Survey: What's Hot in 2010" for ideas ranging from super fruits to black garlic, ancient grains to heirloom tomatoes. How to win: YouTube users will view and rate each video submission. 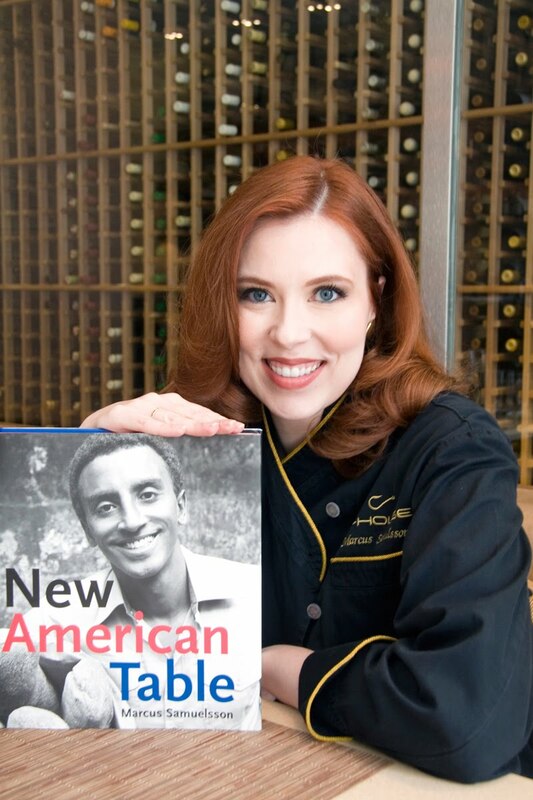 One lucky winner will be chosen by celebrity chef and Top Chef Masters Season 2 participant, Marcus Samuelsson, last year’s Hot Chef Challenge winner Kristina Vanni, as well as a panel of food critics and foodservice industry professionals. 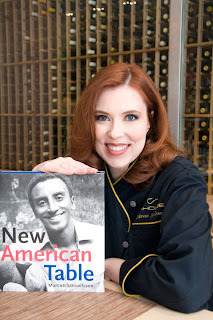 -A special wine-paired dinner at Chef Marcus Samuelsson's acclaimed Chicago restaurant C-House, in the Affinia Hotel Chicago, a value of up to $500. Are All Prix Fixe Menus Created Equal? Chef Week, or Restaurant Week, or any other special prix fixe event offers a great way to get a glimpse of a restaurant without going broke ($30 prix fixe 3 course meal, for example). My experience last night at Sepia left me with many questions regarding these specials. The beauty is the price point, opening up places usually price prohibitive. These "weeks" should be a big bonus to restaurants and present an opportunity to expand their reach and grow their client base. That only works, though, if the impression and execution is positive. Of the many questions one is why do restaurants whip out an entirely new menu specific to the event? I used to think this was innovative and allowed the chef to showcase creativity and range. I am now quite skeptical of special menus, especially from the high end. If the items offered for Chef Week are the same quality, why are they not on the regular menu? Are these items better suited for mass production, anticipating high volume? Are they prepared en mass and not fresh to order? Are the preparers not as familiar with the ingredients and style? If the goal is to bring in a new audience, why not let them choose off the regular menu items to gauge flavor and interest for themselves? I dined at Sepia last night during Chef Week and my experience was, in a word, disappointing. The bar is set very high for a place with rave reviews, awards and prices to match. We were disappointed with not one, but all five of the different dishes served. I have a lot of questions regarding special menus for events (more on that later), but even if what's being offered is not normally on the menu and served in high volume, the quality and taste of a 5 star establishment should shine through. That was not my experience at Sepia last night. For every restaurant that posted their menu online, I have linked to it below. Restaurants not listed did not post Chef Week reference. Some places probably let you make a 3 course meal from the regular menu, but you'd have to check. I will be celebrating Chef Week tonight at Sepia (I have never been). I don't want to single out any one place, but since I ate at Mercadito for New Years, I couldn't help but notice they again offer a steal of a meal for $30. Enjoy your meal. As usual, a number of Chicago Chefs and food personalities are up for James Beard Awards, aka the Oscars for food. The entire nominee list is here. It looks like a slightly down year for Chi-town, but I haven't followed the awards for long. I have highlighted all chicago nominees below. Good luck to everyone, winners announced May 2nd and 3rd, 2010. There is a lot to say when talking about Great Lake. For those unfamiliar, Great Lake is an extremely small (12 seats that I could count) pizza storefront in Andersonville that is open Wed-Sat from 5:30pm-10:30pm. A husband-wife team runs the place and makes the food. Wait times can exceed two hours, even for pick ups. The menu features only 3 pizzas that rotate randomly (each cost ~$21). Even knowing these peculiarities, the buzz is that the pizza is some of the best in the country, using fresh and local ingredients. I was intrigued. Trying to get a table for 3 on a Friday night at 7:30pm was quite foolish. Since we already parked and made the trip, we figured better to order take-out than nothing at all. The only problem is that they have their small oven planned out and that we could come back to pick up our one pie at 9:30pm, i.e. closing time. Even with the wait, the price, the "service," and other "ways I wouldn't run my business," the pizza is good, scary good. I've read that some don't call it pizza because the crust is so uniquely tasty and there is not a lot of sauce or cheese (more like flat bread). 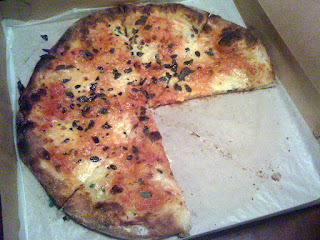 We ordered the #1, most would call it a margherita (cheese, sauce and herbs). I think the local specialized ingredients shine through and taste fantastic. I also approve of the proportions, just the right amount of toppings for thin crust pizza. The crust, however, is the most interesting and delicious pizza crust I've ever had. The bottom stays firm and steady throughout the entire piece, while the actual crust is more like fresh baked bread topped with sea salt. I'm not sure how it's done, but even if I knew, I couldn't replicate the result. Though the pizza was very tasty, I don't think I will be making the effort to have another slice. Quoting a friend of mind, "would I want to go home and eat it tonight? Absolutely." Will I go back, wait for hours, get treated like an alien and pay over $20 for pizza? Not likely. I can vouch for the quality and taste but all of the other intangibles turn me off (and I didn't even eat there). Check it out if you like the adventure and have lots of time and lots of patience. 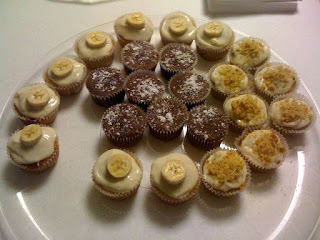 Erica made three different kinds of cupcakes in honor of her mother's birthday. The most popular were the chocolate, but I really enjoyed the banana. The third was carrot cake, shown with bits of walnuts on top. She is a master Baker though so more goods will flow out of the oven. The first two words that come to mind about Purple Pig are European and unique. You get the European feel the moment you step inside. The decor is great with a long, right angle white marble bar, wines on the rack all over the place, wooden tables with the menus hanging from the lights and chalkboard menus on the walls. Our server/bartender was European and reminded us upon handing us the wine list that they do not serve ANY American, New Zealand or "new world" wine. I can't recall perfectly, but they don't serve non-euro beer either. The food, rightfully so, also screamed Europe with the liberal use of olive oil. Carson and I had a great experience with good beer and some "oh my god" good food. We did not order a single cheese or meat sampler because we just assumed it would be good. This was our lunch so we wanted something more substantial. The menu is structured for small plates and sharing. We choose three: Olive oil-Poached Tuna with Greek Lima Beans, Charred Scallions with Romesco Sauce and Milk Braised Pork Shoulder with Mashed Potatoes. We would have ordered the Deviled eggs, but they are not served until dinner. Fortunately for us, each dish that came out was better than the last. Chicago Sun-Times: Illinois to Make restaurants display calorie counts? Chicago Chef Week starts Monday (22-28th March). Great restaurants with cheaper offerings than Restaurant Week ($20 lunch, $30 prix fixe dinners). 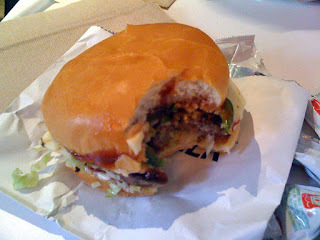 I didn't realize In 'N Out Burger arrived in Chicago until I visited LEYE's latest venture, M Burger. And when I make that comparison to the West Coast institution, I mean it with high compliments. Little things like the cardboard tray, the wrapper and the secret menu items all seem influenced from that famous chain. 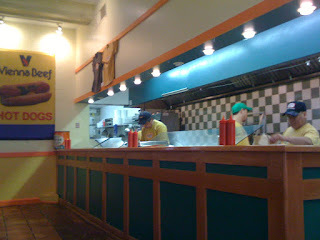 I'm not surprised that a burger stand (literally 8 seats in the place) that shares a kitchen with TRU would serve high quality and delicious food from a very simple and direct menu. The clientele featured a wide range of Michigan Ave. shoppers, hospital workers, business suits and casual diners like me. Be aware, if you go during lunch hours there will be a long line. Your options are straight forward: single or double burger, cheese burger or M Burger, veggie burger or chicken. Everything is priced under $5 and they offer fries and shakes to wash down your sandwich. I went with a secret menu item, the Hurt Burger, served with bbq sauce, lettuce, jalapenos and pepper jack cheese. @grahamelliot gave his location of the new sandwich spot in a twitter post, "Coming out of my self imposed Lenten exile to announce that we signed a lease today and "Grahamwich" will be located at 615 N. State St." I think I already see the line forming. 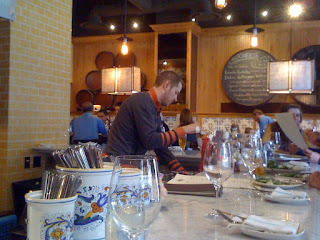 Between that, overseeing Lola and Top Chef Masters, it seems that Mr. Elliot is keeping busy. Our very own Dining Diva has a quick post on the matter too. Chicago 312 Dining Diva -- There's Never a Dull Moment in Chicago's Restaurants and Lounges! 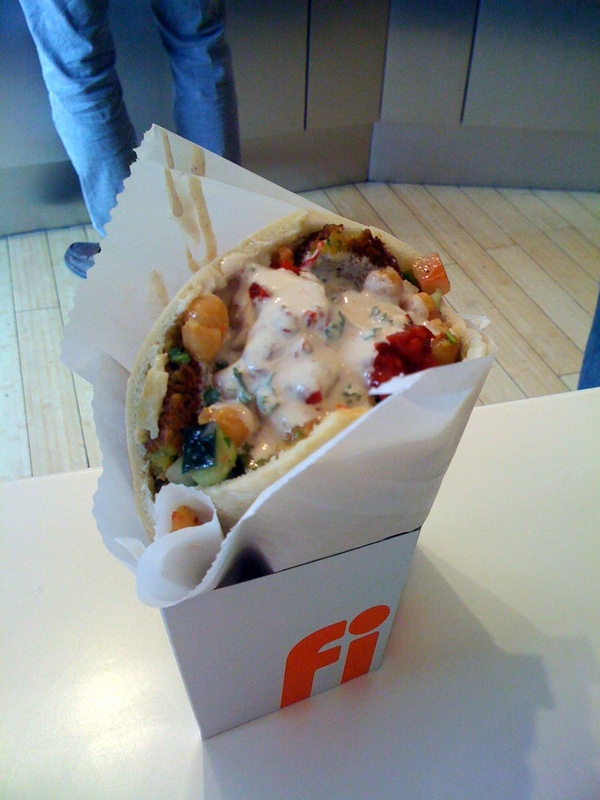 : Grahamwich Location Finally Revealed . . .
For no good reason I wanted to get out of the house last night for some new, cheap food. @SmallBarFull fit the bill. I had no idea the Small Bar franchise was soccer centric, but it was a welcomed change especially with World Cup fever in the air. Also, when they say "Small" Bar, they mean it. It's not a big space but it doesn't need to be. There is a nice long bar on one side, a few large bench tables on the other side and table-tops in between. The menu fits with the setting serving pizza, sandwiches and bar food starters. Additionally, the beer list is as good as I've seen in a while with many craft brews on tap. While the food wasn't bad, I'd make a return trip focusing on drinking and not eating. As for the food, we started with a bowl of their "fabled" veggie chili. 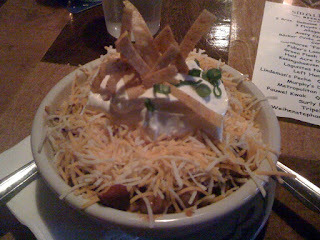 I love chili so I was a little disappointed when the bowl resembled a bean salad more than chili. I love beans, but chili to me is still tomato based with onions, spice and cheese. It also came with a mound of sour cream (to each their own I respect), which kind of defeats the purpose of a vegetarian healthy dish. I enjoyed the beans, flavors and cheese, it just wasn't what I would call veggie chili. We were craving pizza so we browsed the very appealing pizza list and went with the BBQ chicken. The pizza's are 14'', so they serve more than two people, and cost $14. I was impressed with the pizza, but not blown away. Very good for bar food, especially something other than pepperoni or plain. I forgot that BBQ pizza is hard to eat a lot of, and we should have ordered something simpler for our own tastes. I would be curious to try their other pies, especially vegetarian focused options. 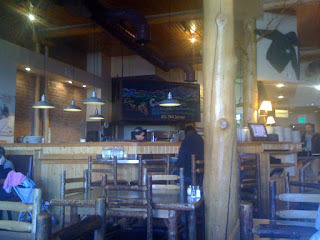 The beer was great, the service attentive and friendly, and the food above average for bar standards. I think the value is only mediocre. I'm also very surprised that there are no daily food specials, something that cash strapped Chicago bar goers seek. Since I don't live down the street I might not make the trek, but the beer menu is fantastic and the next time I want to watch Euro soccer or a World Cup match, I'll head to my local Small Bar. 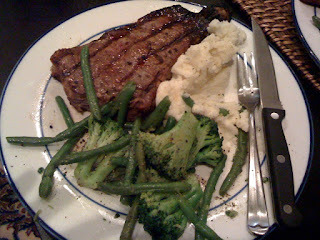 @jrshein and Erica made a very tasty and complete meal for the house last night. Meat and potatoes are Irish, right? We added some green too. Luckily I didn't finish the entire steak and will have it for lunch/dinner today. It could be the start of the grilling season in Chicago. If you ever need an idea for a Friday night dinner, I highly recommend checking out the Italian/Pasta Buffet at Maxwell's located inside the East Bank Club. Full disclosure, I am a member of EBC and have close connections to people at the Club and love many aspects of the country's best health club. That being said, it doesn't change or affect my opinion about one of the best deals in town on a Friday night ($28/adults $12/children for all you can eat Italian antipasto and make-it-yourself pasta bar, plus dessert). We started by ordering off the menu a small starter to have with our cocktails, ahi tuna bites. Nice little pieces of tuna served on tortilla with avocado, corn and salsa. I prefer my tuna rarer, but the flavors were all a nice way to start the meal and don't leave you feeling stuffed. There was a great gathering at C-House (Affinia Hotel) today for a photo shoot with Kristina Vanni promoting the Hot Chef Challenge 2010 and the NRA Show 2010 (the world's largest restaurant and food-service industry event). Check it out May 22-25 at McCormick Place. In addition to Kristina, local online talents MJ Tam and Jennifer Luby were in attendance; check out their sites for "home entertaining advice, ideas and inspiration from a Chicago hostess," and "A site for Chicagoland's active families." Since I like to focus on food and restaurants, I'll give my two cents on the amazing tasting menu we consumed with pictures. 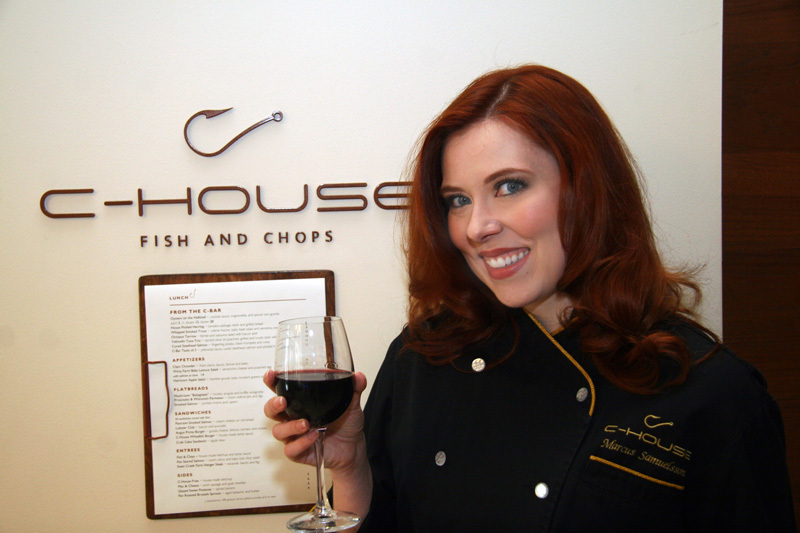 Chef Nicole Pederson gave us a sampling of why she is nominated for Best New Chef in TOC's Eat Out Awards 2010. She earned my vote even though I didn't taste all the other nominees. C-House has been on my list of places to check out for a while and this teaser tasting made me want to book something sooner rather than later. I don't have a menu in front of me, and even if I did I probably couldn't tell you everything I tasted. The flat-breads were fantastic and I really liked the mini bite-sized fish tacos. They were quick bites of fresh fish, crunchy shell and avocado spread. 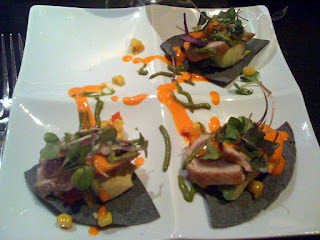 The Tuna Trio was also tasty, though I only took a small piece of one of the options. And then there were the fries with homemade ketchup. I could have had 100 more, and I loved the ketchup - fresh with a hint of spice to make it unique and flavorful. Dessert was equally delicious and overwhelming. We started with homemade doughnuts that we split 9 ways, and that was followed by an enormous tasting plate of candy-store treats. 9 plates for 9 people, right? The food was great, a high class addition to the Michigan Ave. neighborhood. It was also a pleasure to meet Kristina and the NRA 2010 crew. I look forward to the show and quickly returning to C-House for a full meal prepared by (hopefully) award winning Chef Nicole. Thanks again to everyone that made today possible. I made a quick stop into Gilt Bar after dining down the street. We went for an after dinner drink, and ended up with a bottle of bubbly. No food and no rating yet. The decor is as cool as advertised, and my quick glance at the menu showed promise. My only complaint was that it took a long time get our bottle, someone had to get it from the basement and it took over 10 minutes. Otherwise we had a good, quick time and I look forward to returning for a real taste/experience. Tonight we had dinner at Kinzie to celebrate a birthday. Lucky for us they still offer their 3 course prix fixe for $20, quite a good deal. Unlucky for me the food didn't taste all that great, but we didn't leave hungry and enjoyed great company. The menu was more extensive than I expected, offered a number of choices for the entre including salmon, tenderloins, pasta and chicken. 3 of the 4 of us ordered the tenderloin with one ordering the salmon. The salads were nothing to write home about, especially mine, but the Caesar looked and tasted well. My tenderloin dish was mediocre and slightly over cooked with no real flavor to speak of. I know it's tenderloin and not fillet, but still disappointing. My mashed potatoes were very tasty and the sauce served on the plate did help overall satisfaction. My one small taste of the salmon dish further underscored the tenderloin's quality vs. other options. I'm sure there is high quality food served here, I just didn't order it tonight. Our desert course was all-around pleasant. The ladies finished the chocolate cake, while the men did good damage to the cheesecake. The service was very good. 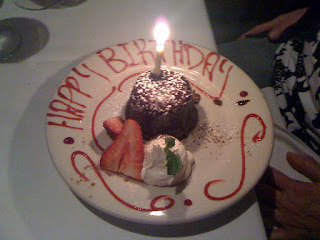 We didn't even need to prompt for a candle in the birthday girl's cake, and the owner came over to say "happy birthday." 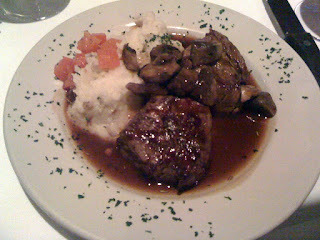 I had never been to Kinzie Chop House even though I've walked past it many times. I could taste hints of greatness but it never materialized fully into a complete meal. Maybe it was what we ordered, party due to the cheap prix fixe menu. We didn't leave hungry and most importantly, we celebrated a birthday in style. You know there is a burger craze when names like Kornick, Morton (DMKBurgerBar), and Melman (M Burger) join the scene. 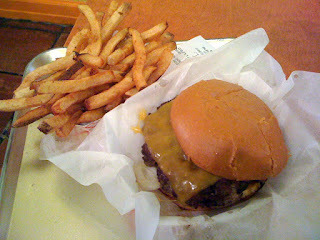 Then there's Edzo's, nominated not only for best new burger join in Chicago, but also BEST NEW RESTAURANT and most in demand dish. This all comes from a college town spot serving burgers, fries and dogs for less than $5. Living in the city makes ventures up to Evanston tough to come by, but luckily I was in the neighborhood today and had to check it out. 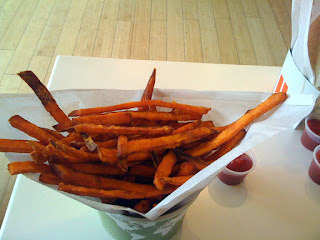 You can read all about the hand cut meat and fries lots of places, so I'll just comment on the flavor I experienced. I loved my 4oz single patty cheeseburger topped with everything. I'm not one for large patty's so this is exactly my type of burger. Everything tasted fresh and delicious and I didn't waste a lot of time to consume my sandwich (I definitely could have used some tums walking out of there). The fries were also excellent, fresh cut and fried to perfection with the appropriate amount of salt. I'm not a burger connoisseur but this is as good as I've had in a long time. Other new places try to get fancy and special, Edzo's keeps it simple and delicious. If I lived near by this would be my go to spot for cheap and tasty eats. It may not be worth the pilgrimage for a $5.75 meal, but if you do you won't be disappointed. I don't know if I can vote for a burger joint for Best New Restaurant, but it definitely earned my vote for Best New Burger Joint. The counter top where the magic happens. We had some money left on a gift card, and we were in the mood for noodles. Joy's is one of my favorites, and my update is at the bottom of my previous post. 2010 James Beard Awards: The Semifinal List: "[Press Release] New York, NY (February 18, 2010)"
I guess I'm a little late to this party, that's what you get for skiing a month in Wyoming. Looking forward to the final nominations due out in 12 days. We made a quick, and I mean quick stop into Bozeman before our flights. We found this cute pizza place on main street after trying to eat at local brew pubs. Little did I know it was #1 on Urbanspoon in Bozeman. As our only stop for about 35min, it represented the town well. 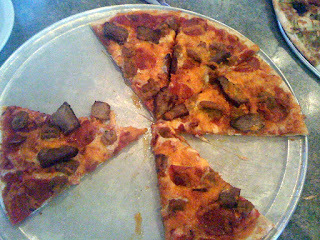 We each had a different local brew, and ordered two large pies: the Sequoia (veggie) and Stockman (all meat). Cool decor, not well captured here, but fun coat hangers and lights. There is a hanging canoe right above us. 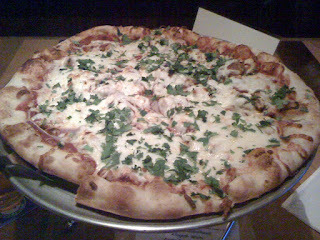 The Sequoia pizza was not my favorite, but it wasn't bad. 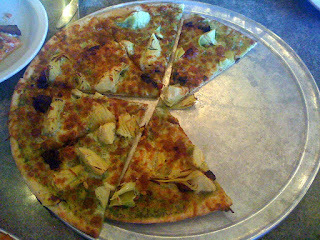 The pesto was too subtle or over cooked, and artichokes are not my preference for pizza. The crust/dough was very tasty though and well cooked. As you can see, I couldn't even get my camera out in time before half the pizza was taken. This was a meat lovers dream, steak, pepperoni and sauggage. It's also a few bites short of a heart attack. The problem is you want to take those bite because this was one of the best tasting meaty pizzas I've had in a long time. I usually go with healthier options, but when in Rome (i.e. Montana), meat is called for. Even though we only had a few minutes for food before catching our flight, I'm glad we got a taste of the local scene (pun intended). If you are looking for a place to eat in Bozeman, I only have one experience to reference, but I highly recommend MacKenzie River Pizza.